For all Hip fans – or gift-givers to Hip fans. 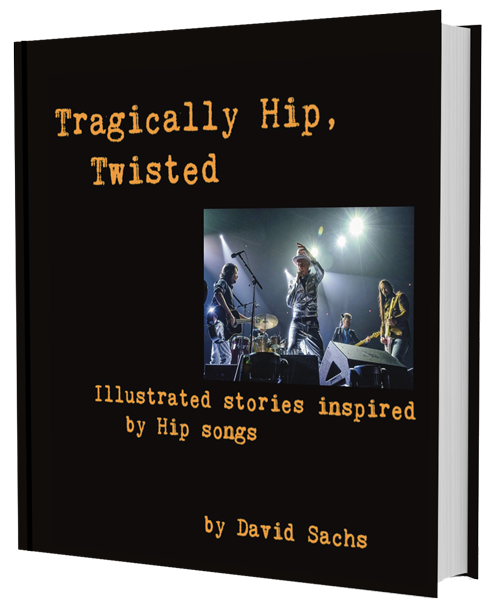 9 short story ‘covers’ of Tragically Hip songs in large-format hardcover, accompanied by evocative full-colour images of the band and Canadiana. 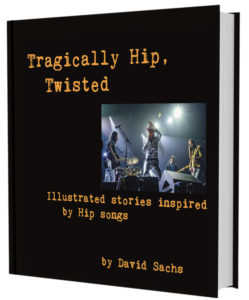 From a Huron tribal village in 1633 to a high school cottage party outside Winnipeg, Tragically Hip, Twisted includes haunting, funny, touching and weird short story versions of Hip classics, including Locked in the Trunk of a Car, Looking for a Place to Happen, Scared, and more. This collection includes the new story Put It Off, and the National Post eBook of the Week, Lionized & Little Bones. Now available in Chapters stores Canada-wide, and on Indigo, Amazon and other on-line outlets. The stories stand on their own – you don’t need to know the music. These print and ebooks raise funds for the Gordon Downie Fund For Brain Cancer Research at Sunnybrook Hospital. Links to the music behind each story are below. Étienne Brûlé, the famed first of the coureurs du bois (‘runners of the woods’), the 17th century French explorers and traders of wild Canada, faces death among the Bear tribe of the Huron Indians, and debates his life’s value with a French priest. /(Historic Adventure). The Hip’s songs are evocative to me in a way other bands aren’t. Maybe it’s just me. I find the songs, the ones that don’t tell stories directly, often tell story snippets, or carry unusually nuanced emotions. The listener can piece together a multiplicity of stories. I think this is part of the reason Gord has been so interesting as a frontman: the songs have this expressionistic character that he can interpret in different ways. In my stories, I pick one interpretation. The first one I did was Locked in the Trunk of a Car, must have been 15 or more years ago. The others have been written over the intervening years. I’ve also had preliminary stabs at New Orleans Is Sinking; 50 Mission Cap; Wheat Kings; Are you Ready? ; and Boots or Hearts – hopefully there’ll be a second book some day. I’ve tried to take the feelings and contours of the songs from one medium to another – like Fantasia. I listen to the song on repeat while I write: I hope the mood carries that way, and lyrics wind up in the narrative. The stories stand on their own – you don’t need to know the music. But for a unique musico-literary experience, I recommend listening to the respective songs, low, on repeat, while reading, just as I wrote it. Or don’t. It’s a free country. Links to download each story’s foundational song are here. No songs were harmed in the writing of these stories.